“Neil Armstrong – A Life of Flight” is a thoroughly enjoyable new biography about the first human to set foot on the Moon on NASA’s Apollo 11 mission written with gusto by Emmy winning NBC News space correspondent Jay Barbree. Jay Barbee is a veteran NBC News reporter who has covered America’s manned space program from the start. And he has the distinction of being the only reporter to cover every single American manned space launch – all 166 from Alan Shepard in 1961 to STS-135 in 2011 – from his home base at the Kennedy Space Center in Florida allowing him to draw on a wealth of eyewitness experiences and inside contacts. 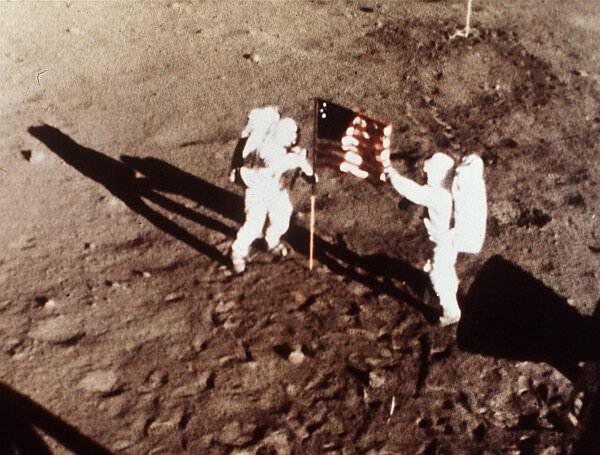 The book’s publication coincides with the 45th anniversary of the Flight of Apollo 11 on America’s first manned moon landing mission in July 1969 by the three man crew comprising Commander Neil Armstrong, fellow moonwalker and Lunar Module Pilot Buzz Aldrin and Command Module pilot Michael Collins. It’s a meticulously researched book over five decades in the making and based on personal interviews, notes, meetings, remembrances, behind the scenes visits, launches and more between Neil Armstrong and his trusted friend Jay Barbree as well as hordes more officials and astronauts key to achieving NASA’s spaceflight goals. He won that trust because the astronauts and others trusted that he would get the story right and never betray confidences, Jay told me in an interview about the book. There is a six page list of acknowledgments and the forward is written by no less than John Glenn – the first American to orbit the Earth in 1962. Barbree is a master story teller who amply illustrates why NASA felt Armstrong was the best candidate to be 1st Man on the Moon based on his extraordinary intellect, piloting skills, and collected coolness and clear thinking under extraordinary pressure. Armstrong also always shied away from publicity and bringing attention to himself, Barbree told me. “Neil did not think he was any more important than anyone else. Neil wanted to do a book about a life of flight. But he wanted everyone else included.” And that’s exactly the format for the book – including Armstrong’s colleagues in words and pictures. On July 21, NASA officially renamed a historic human spaceflight facility at the Kennedy Space Center in honor of Mission Commander Neil Armstrong – read my story here. Barbree details Armstrong’s lifetime of flight experiences that led to the ultimate Moon landing moment; starting with his early experiences as a Korean war combat pilot and bailing out of a crippled Panther F9F fighter plane, flying the X-15 to an altitude of 39 miles and the edge of space as a NASA test pilot, his selection as a member of the second group of astronauts on September 17, 1962, his maiden space mission on Gemini 8 which suddenly went out of control and threatened the crews lives, and finally the landing on the Sea of Tranquility with only 30 seconds of fuel remaining. “Neil Armstrong – A Life of Flight” is a book for anyone interested in learning the nitty gritty inside details starting from the founding of America’s space effort, the trials, tribulations and triumphs of the earlier Mercury and Gemini manned programs, the terrible tragedy of the Apollo 1 fire and death of three brave Americans – Gus Grissom, Ed White and Roger Chaffee – and how all this swirl lead up to America’s determined and miraculous effort recounting how we got to the Moon. Go elsewhere for gossip. This hefty 350 page volume is absolutely chock full of details including copious quotes on virtually every page. So much so that Barbree brings the along reader for what seems like a firsthand account. It’s as though he were a fly in the room listening in on history being made and transcribing it second by second or as an actual crew member riding along himself and reporting ultimately from aboard Apollo 11 and the Moon’s desolate surface. Barbree does this by putting into context the full meaning and breadth of what’s happening on a moment by moment basis. Giving you the reader a complete understanding of what, why and how these history making events transpired as they did. I found his background information endlessly illuminating and informative ! – precisely because it’s not merely a transcription of dialogue. “He had thought about one statement he judged had meaning and fit the historic occasion …. Neil had not made up his mind … he was undecided until he was faced with the moment. Armstrong then lifted his left boot .. and set it down in moon dust. What most didn’t know was that Neil had meant to say, “That’s one small step for a man,” and that set off an argument for years to come. Had a beep in transmission wiped it from our ears or had Neil nervously skipped the word? Knowing Neil’s struggles with public speaking, I believe the latter, and with all the excitement … I’ve never been convinced Neil knew himself for sure,” Barbree wrote. I also enjoyed towards the end of the book where Jay includes Neil’s disappointment that we haven’t ventured beyond Earth orbit in over 4 decades and includes Neil’s personal testimony to Congress so we learn the detail of Armstrong thoughts – in his own words. It’s been my privilege to get to know Jay during my own space reporting from the press site at the Kennedy Space Center and interview him about his magnificent new book. Despite Armstrong’s premature passing, Barbree told me he had completed all the interviews. “There isn’t anything that comes to mind about Neil Armstrong that I didn’t get to ask him,” Barbree told me. Jay Barbree is on a book signing tour and you might be lucky to catch him at an event like a colleague of mine did at the Smithsonian National Air & Space Museum recently. See photo below.